Conservative Anglican bishops pressed the head of the worldwide church over homosexuality at a conference this week in Uganda, demanding he "sort out" the crisis facing the world's third-largest Christian denomination. Bishops from Singapore, Southeast Asia and Africa told Archbishop of Canterbury Rowan Williams in closed-door sessions Tuesday and Wednesday that there should be no more diplomacy on homosexuality, an issue that has split the Anglican communion. 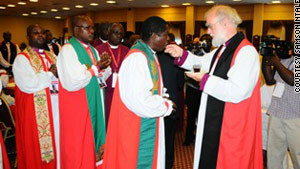 Archbishop Henry Luke Orombi, head of Uganda's Anglican church and the host of the week-long All Africa Bishops Conference, said the Archbishop of Canterbury (pictured administering communion at the conference) faces a complicated task in trying to reunite the church. "He (Williams) spoke what was on his mind and we also spoke. We impressed it on him that he had totally gone in a different direction and he has to sort it out," Orombi told journalists after their closed-door meeting on Wednesday. "We sympathize with his position as head of the Anglican communion suffering disunity on moral grounds and teaching of the scripture. It's like having unruly kids in his house and he can't sit down to eat food." "We have told him and he understood us, that (there's) no more diplomacy on that matter, homosexuality. We made our minds very clear and he is going back knowing there is no gray area on our part," Orombi said. Journalists who tried to question Williams on the subject at the conference were rebuffed by aides who surrounded him. The archbishop returned to England Thursday, but CNN calls to his office were not immediately returned. However, Williams preached tolerance in a sermon after the meetings, reminding African bishops that a good leader does not abandon his flock. He did not bring up the issue of homosexuality. "Every human being is precious to God," the Archbishop of Canterbury said. "We need to be seen as church leaders who address the real issue affecting our people. ... We need to be there with people who need amnesty." Williams has condemned the consecration of openly gay bishops in the United States' Episcopal Church, which is part of the larger Anglican communion, saying the move deepened the rift within the church and calling for a diminished role for the Episcopalian faction. Ian Ernest, archbishop of the Indian Ocean and chairman of the Coalition of African Prelates Association, described the meeting with Williams at the bishops' conference as a session that was "done courteously, and in an open spirit of brotherhood." "There is consistent propaganda to make the lie appear the truth and we should counter it with truth that the God's primary intention was not for a man to marry a fellow man," Ernest said. Overall Archbishop of Nigeria, Nicholas Dikeriehi Okoh, agreed. "We are discussing with others to give them pastoral counseling to overcome the difficulties in their sexual orientation," Okoh said. "We stand for family in the sense of man and woman having children. We don't believe that two men or two women can create a family." Despite homosexuality being unacceptable, Orombi said, gays and lesbians should not be killed–as called for in the anti-homosexuality bill proposed in the Ugandan parliament–because they are people in need of help. The Anglican Church counts 77 million members worldwide.